• IQ™ Insulated Fabric is 35% warmer than a comparable non-insulated shelter. • Everything fits into an oversized duffle bag that can easily be carried onto the ice. 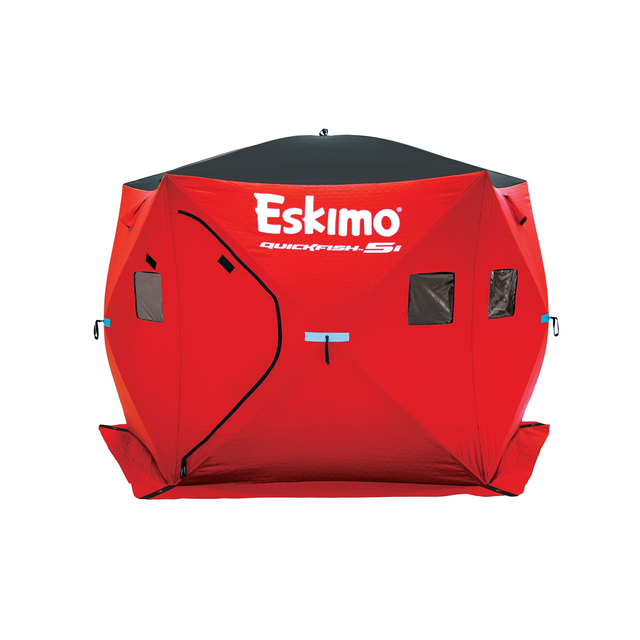 • Heavy-duty material is used and sewn over corner joints for reinforcement and YKK® zippers are standard on every Eskimo shelter. An extra-long skirt helps eliminate drafts and keep the elements out. • Set-Up Size: 108" x 108" x 108"
• Elbow Room: 90" x 90"
• Fishable Area: 64.0 sq. 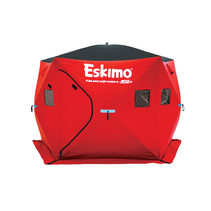 ft.
• Collapsed Size: 11" x 11" x 63"
| Color: Red | Description: Insulated Pop-up Shelter | Size: 108" x 108" x 108"